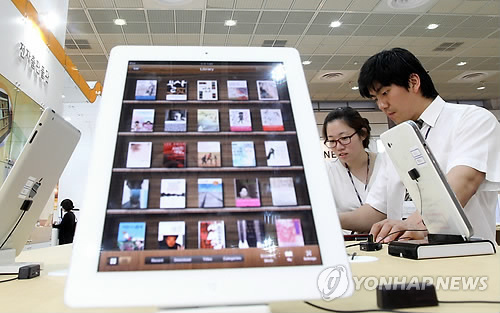 The South Korean market for electronic books (e-books) is expected to grow 80 percent this year on the back of rising demand for services on mobile devices, local analysts said Wednesday. According to Taurus Investment & Securities Co., the size of the local market for e-books is anticipated to reach 583 billion won ($519.8 million) in 2013, compared to 325 billion won tallied a year earlier. Market watchers said the increase is mainly attributable to the rising number of South Koreans holding smartphones and tablet computers, while more local publishers set their sights on the e-books industry. “The demand for e-books will continue to increase in the future due to the availability of mobile devices sized 5-inches and above, which makes electronic contents more readable,” said Kim Ji-hyo, a researcher at Taurus Investment. The full-fledged launch of tablet computer line-ups by Samsung Electronics Co. since the second quarter of 2012 also allowed more consumers easy access to the state-of-the-art content, market watchers said. Nearly 40 percent of the country’s publishing companies release more than half of their books electronically, industry data showed, adding to the rosy outlook over the market. The global market for e-books is anticipated to jump 36 percent on-year in 2013 to reach $111.8, separate data compiled by global consulting firm PricewaterhouseCoopers also showed.